Superstar Rajinikanth’s ‘Vikramasimha’ is gearing up for a massive release this Friday. The film is releasing in more than 3000 theatres across the world, in Telugu and Tamil. 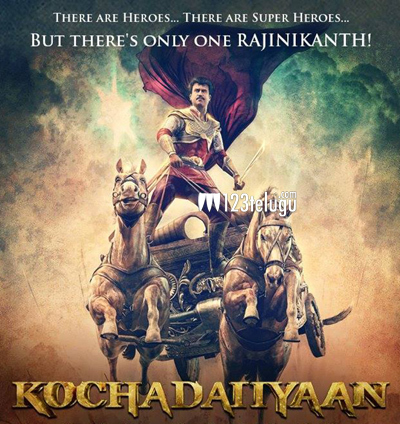 The film has been titled ‘Kochadaiiyaan’ in Tamil. As per the latest info being heard, the movie is being released in 413 theatres in Tamil Nadu (count might increase) and 400 theatres in Andhra Pradesh (count might increase). The film is also getting ready for a release in Kerala and Karnataka along with a massive overseas release in Malaysia, Singapore, USA, UK, Australia etc. The film is being promoted as India’s first motion capture film and Rajinikanth’s daughter Soundarya has directed this movie. Deepika Padukone is the heroine in the film and A. R. Rahman has composed the music.